My July favourites feature a whole host of new beauty discoveries which I have been loving over the past month and are all products that I haven't featured on here before, so enjoy reading! One of Aveda's latest releases, their Thickening Tonic is amazing and I don't say that lightly. I'm always on the quest for products that will help bulk up my fine hair and this does exactly what it claims it will do. It's like a leave-in conditioner that you spritz all over your hair after washing and towel-drying. I like to blow dry mine so I'll use this before and voila, hello fuller, bigger hair! The results are of course temporary, but I absolutely love seeing the difference this makes to my hair. It's also 97% natural and smells gorgeous. I've wanted to try this for ages and I can now see why so many skincare fans say it's one of their favourite face oils. This rescue oil is a total skin saviour and the ideal companion if your skin is a bit temperamental and prone to flare ups and breakouts like mine is. It soothes, hydrates, brightens and transforms your complexion overnight which is also great for a quick facial fix after a long week. It's been quite hot and humid recently, so I've been reaching for this lovely toning mist from Botanicals to help me cool down. Made with 100% organic natural ingredients, it has key ingredients such as Chamomile to calm irritated skin, anti-oxidant White Tea and fresh toning Mandarin to keep skin happy. It's a handbag friendly sized bottle so great to use on the go and for popping into your holiday travel bag too. Nothing quite smells like summer than coconuts and this bath and shower gel from Treaclemoon has a delightful sugary sweet coconut scent. It comes in a huge budget friendly bottle which will last months and months. I always have Argan Oil in my bathroom because it's a great multi-purpose oil that can be used on face, body and hair. 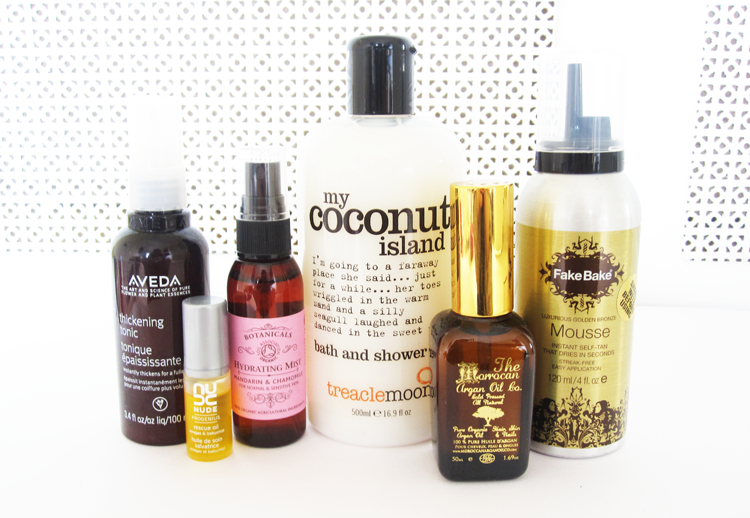 My favourite ways to use it are as an intensive hair treatment and as a face oil. This one from The Moroccan Argan Oil Co is 100% pure and cold pressed, ecocert approved and comes in a convenient spray or dropper format. I couldn't have a July Favourites without a self-tanning product included, so this month my self tan of choice is Fake Bake's exceptional Instant Self-Tan Mousse. Super easy to apply, you just pump it out into your hands (remember to wear gloves or a tanning mitt!) and it glides on smoothly when you rub it into the skin. It tans instantly so you can see where you have applied it and it delivers a natural looking, streak-free finish with a better than average self-tanning scent. I got given a Treacle Moon scrub at an event yesterday. It smells amazing so I would love to try out more from them. Coconut sounds right up my street! I love Botanicals Mandarin & Chamomile Hydrating Mist! It's one of the best toners I ever tried and want to buy it again in the future to treat myself again.. If I was to choose one of the beauty products I've been loving lately, it must be OMG serum from LJ's Natural - it's great for my combination skin (I use it in the evening and I wake up with nice, soft skin, any breakouts and redness reduced). Oooh that shower gel sounds lovely! I love the smell of coconuts - it's such a summery scent!